Hello and welcome to my second post for today. 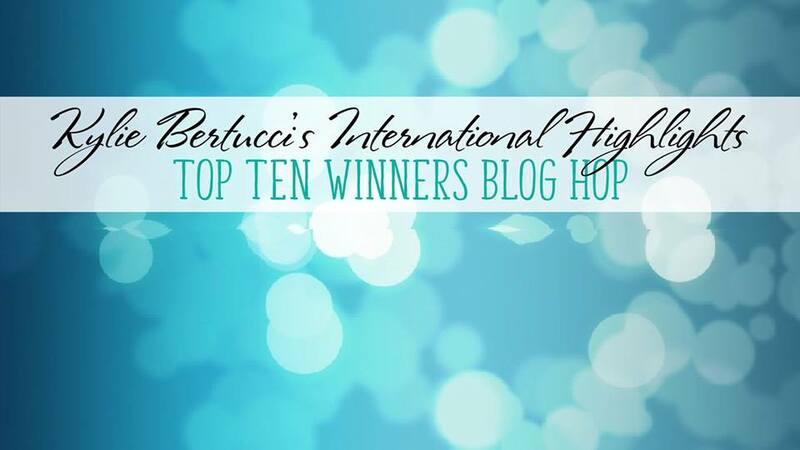 And, I am super excited to be part of Kylie Bertucci's International Highlights Top Ten Winners Blog Hop this month. This month's theme was Encouragement. 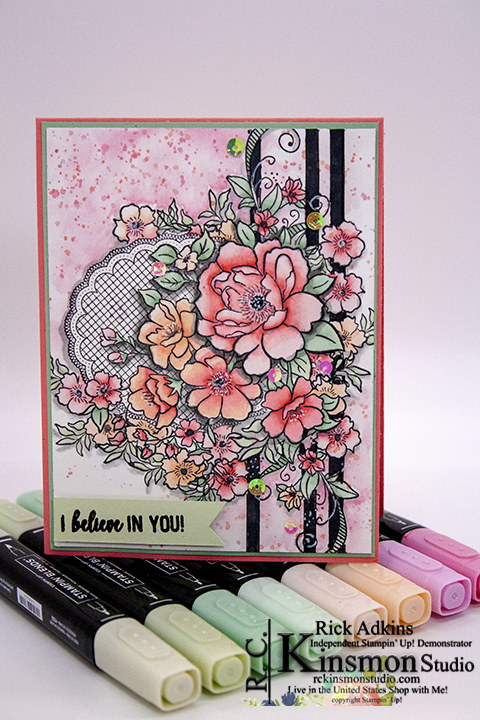 I created a card using one of the same stamp set that I used on the card that was picked as a wining card. I will share a look at that card in just a little bit. 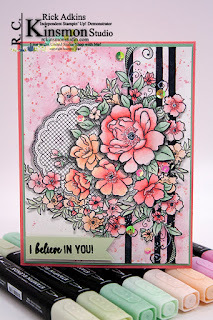 Here's a look at the card I created for today's blog hop. Here's a look at the card that was picked as one of the wining cards for the International Highlights. I used the same techniques that I used earlier today on my card this morning. I stamped the image on my piece of Thick Whisper White Cardstock (4 x 5 1/4), but instead of stamping the Lovely Lattice image up and down I turned it on it's side and then stamped it. 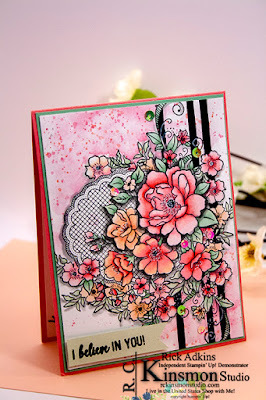 This created a totally new look for the stamp set which worked really really nicely. 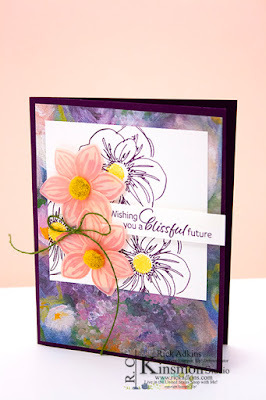 I then masked off the image and stamped the vine image from the Beauty Abound Stamp Set. 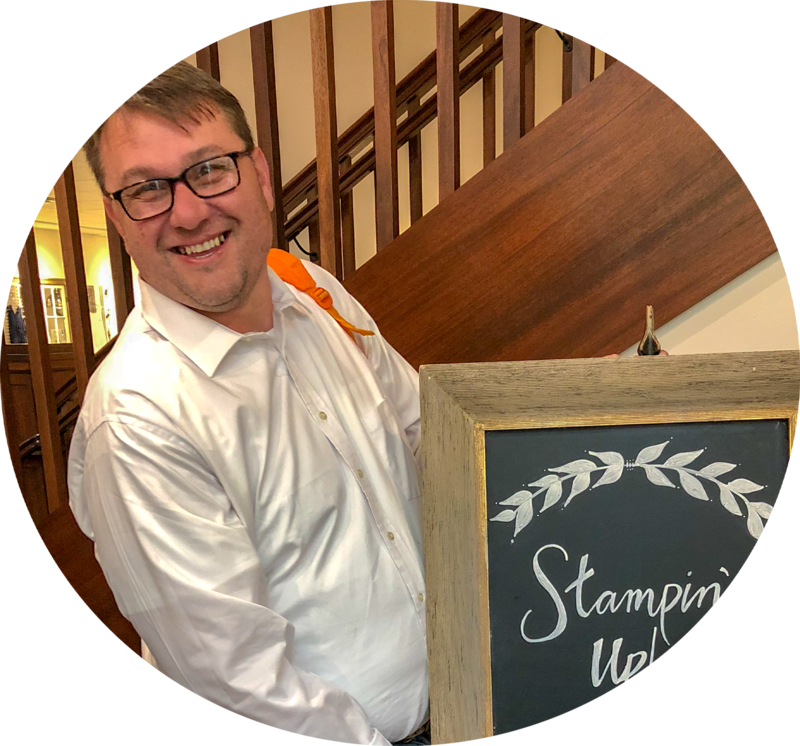 I removed the mask and started coloring with my stampin' blends. As far as the colors goes I used Flirty Flamingo Light & Dark mixed with Petal Pink light and dark and a little pink pirouette (which is retired but mixed beautifully with the flirty flamingo.) 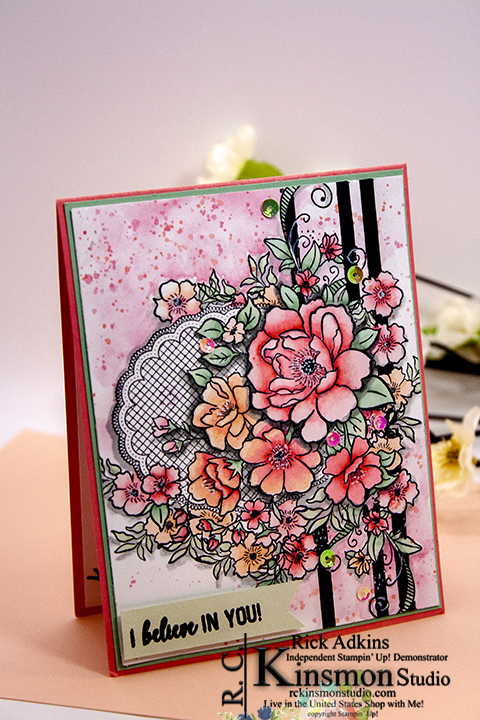 You can currently find the Pink Pirouette Stampin' Blends in the Clearance Rack at this time. To color the leaves I used Mint Macaron (light & dark) and Soft Sea Foam (light & dark). After all the coloring was complete it was time to do a little watercoloring. I took my watercolor paint and mixed up two colors. I mixed one that was as close to Flirty Flamingo and Petal Pink as I possibly could. I added a little water around the top left and bottom right corners of the flowers and added a little paint and let it flow. I then flicked on some watercolor into the still damp paper. You can watercolor on the Thick Whisper White cardstock as long as you use very little water, and don't flood the paper with to much water. The flicking allowed for the texture on the cardstock. At this point it was time to dry it. I hit it with my heat tool until it was completely dry. I ran it \through my Big Shot to flatten the paper back out. Here's a close up look at the coloring. 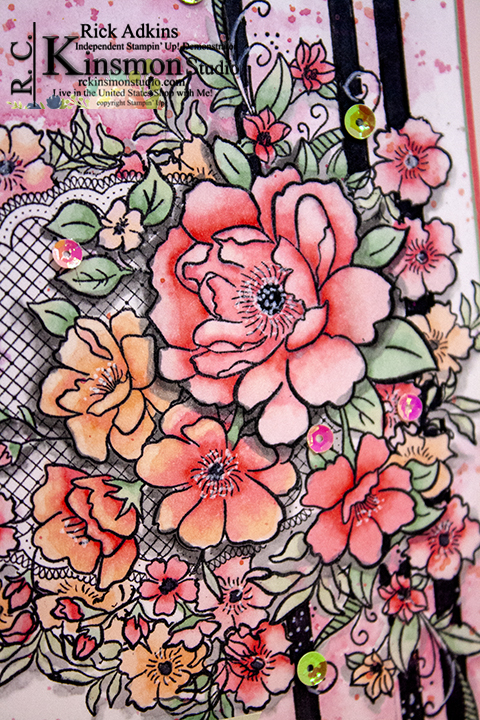 Once I had all the coloring done it was time to add the graphic detail to the card. 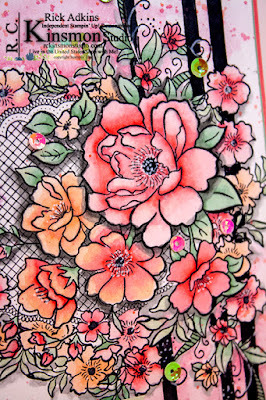 I took a t-square ruler and a pencil and added a few lines behind the stamped and colored flowers. I did six lines total and then used journaling pens and went over the pencil lines. After that I took the Basic Black Stampin' Blends and colored the lines in. To make the lines from the vines that disappeared from coloring in the lines; I used a white gel pen and went over them. I only went over the parts that would overlap the black. I did go in and added some white dots on all the flower centers to add a little more texture. To finish off the card I added a few of the Iridescent Sequins in Powder Pink and Pear Pizzazz. I adhered them with a little multipurpose liquid glue. Once I did this I added the card front to a piece of Mint Macaron Cardstock cut at 4 1/8 x 5 3 /8. 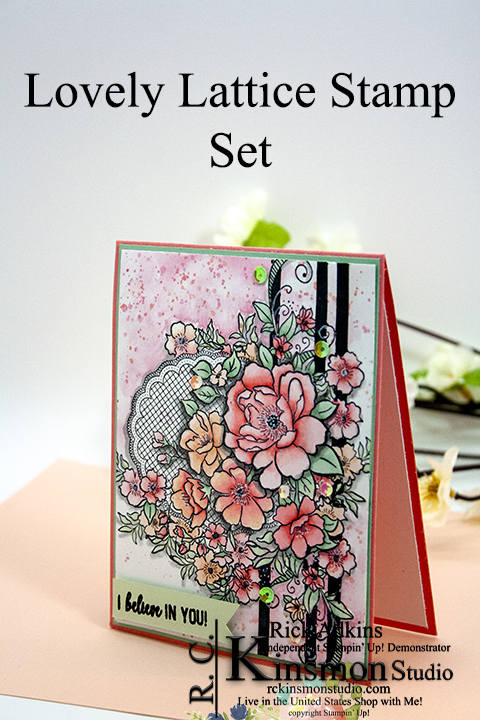 I then placed the entire card front to my Flirty Flamingo Card base (4 1/4 x 11 scored at 5 1/2). I did add a whisper white insert to the inside of my card that was cut at 4 x 5 1/4. As I sat and looked at the card which I always do to make sure it was complete or not. I decided that It still needed a sentiment on the outside of the card. 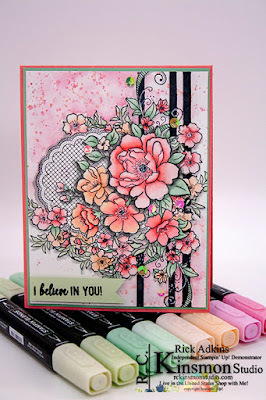 So I took a small strip of Soft Sea Foam cardstock and my versamark ink pad and stamped the I Believe in You sentiment from the Amazing Life stamp set in the 2019 Occasions Catalog. This was the perfect sentiment for an encouragement card. I mean really what better sentiment could I have picked than that. Thanks for dropping by today for the blog hop I know the other winners have done a great job with there cards for you you will find the blow roll below. Below the blog roll you will find the shopping list for this project. 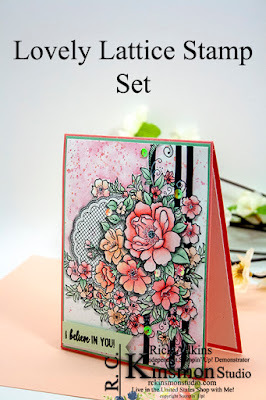 Remember that we have just kicked off Saleabration and you can earn the Lovely Lattice Stamp Set as your free Saleabration item with a $50 order in my online store. Such gorgeous coloring, Rick! I couldn't stop staring at it! Swoon! 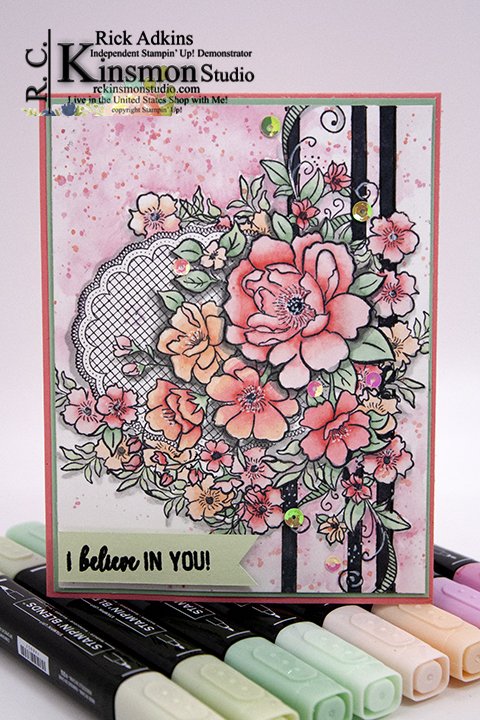 This is so beautiful and such a delightful contrast to your earlier card. Terrific job with the Blends! Excellent card! 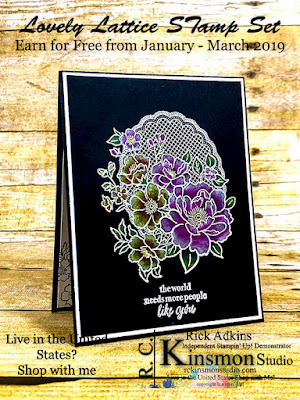 LOVE your coloring, Rick - perfection with the Blends! And I love that you added a touch of watercoloring, too... thanks for the inspiration! Just stunning! You put a lot of love into these cards! Lots of detail, must have taken hours! Stunning and love the use of the blends.